This is the second locomotive to have the I class classification (see I38 for first I class). 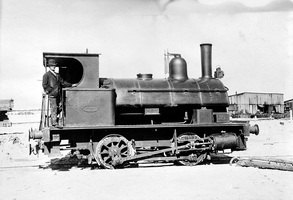 This broad gauge locomotive was originally imported by Victoria for work on a private railway in that state in 1888, this locomotive eventually came into the possession of contractors "Waring and Rawdon" circa 1903, who were to use it in their work of reclamation, construction and development of Outer Harbour, South Australia, in 1908. It passed into the hands of the South Australian Government via the Engineer-in-Chief's Department, from whence it was handed over to the South Australian Railways in 191 0. Numbered 161 and with the nickname of "Dirty Gert", most of this engine's working life was spent shunting the Port Adelaide wharves and marshalling yards with their associated tight curves. Driving Wheel Diameter: 3 ft. 0 in. - Diameter x stroke: 12 in. x 18 in. Boiler Pressure: 145 lbs p.s.i. Overall Length 21 ft. 5½ in. "Beyer Peacock - Manchester, England" built 0-4-0 saddle tank type broad gauge steam locomotive.